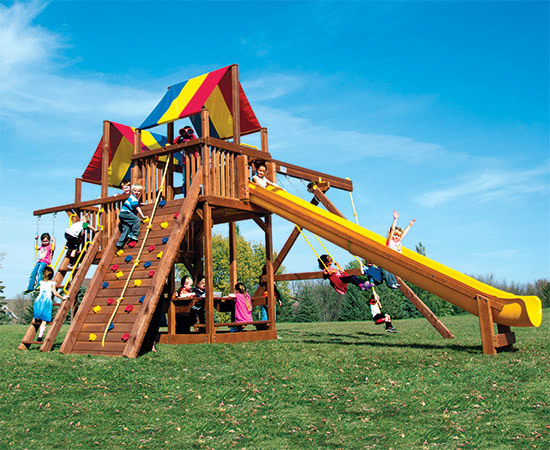 Welcome to our colossal collection of Clubhouse outdoor playsets! Create unique and imaginative spaces by utilizing the many playset accessories for the upper and lower platforms. The Clubhouse style is a great solution for compact yards, yet the versatile playset can still pack a ton of play activities like picnic tables and playhouses. playsets come in multiple deck heights and sizes. Pick the perfect playset size for your family! Packed full of fun, our entry level Fiesta Clubhouse series is compact, which is perfect for the smallest backyards. The lower deck height of 5 feet is great for young children! 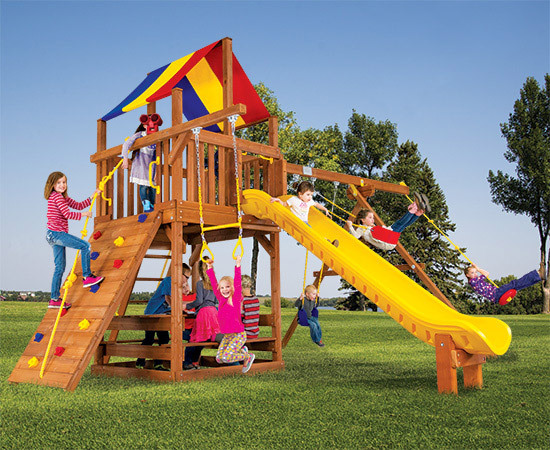 The Carnival Clubhouse playsets are taller with a 5’ 6” deck height and 8.5’ swing beam height with your choice of the 10.5’ length slides. The 5’ x 5’ deck size Carnival Clubhouse is part of our Best Value Carnival Series celebrating it’s 25th Anniversary! The Sunshine Clubhouse swing set has a 5.2’ x 5.2’ deck size which means more play space for energetic kids, and substantially more add-ons and options! 2019 represents a milestone in Rainbow’s 34 Years of History as we Celebrate Sunshine, our #1 ALL-TIME MOST POPULAR Series!!! 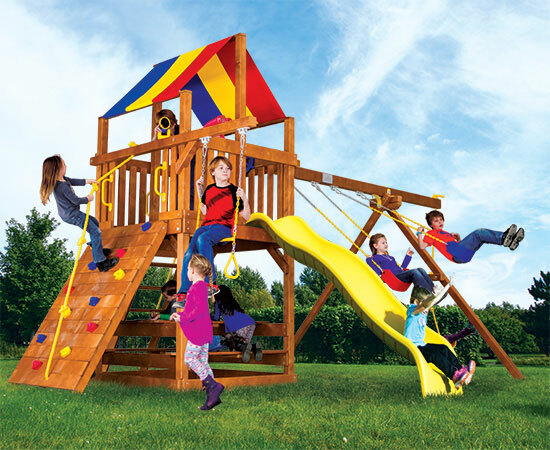 The Rainbow Clubhouse playsets are the industry leader in construction detail and design! These sets are great for kids of every age and fit in most modestly sized yards. The Monster Clubhouse swing set has a 6’ deck height, 9.5’ swing beam height and the 11’ Super Scoop Slide with the 5.2’ x 7.8’ deck size. The Monster Series boasts the most unique designs & our 2019 Monster line up stays true as our most unique series, including our ultra unique Huckleberry Hideout Series. Touch the sky with our biggest swing set, the King Kong Clubhouse! With its deck height of 7’2”, there’s ample room to customize with unique swing set accessories.